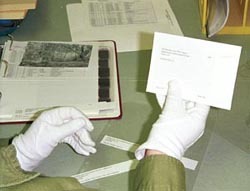 Photographic processing and cataloging activities at the Stabilization Laboratory, U.S. Army Corps of Engineers, St. Louis District's Mandatory Center of Expertise for the Curation and Management of Archaeological Collections. From the photograph collection of the U.S. Army Corps of Engineers, St. Louis District. Inventories may take some considerable time and funding to complete and maintain. As a result, inventorying often has been an overlooked aspect of collections care with the result that many repositories, as well as federal, state, tribal and local agencies, have had little idea about the exact contents of their collections. The passage of NAGPRA and 36 CFR 79 has helped change that. NAGPRA required repositories to complete inventories of all Native American human remains and associated funerary objects by 1995. 36 CFR 79 requires repositories to conduct "periodic" inventories and inspections of any federal collections that they care for and manage. For objects, inventories function as periodic checks to account for items in a collection and to update their accession and catalog records. There are three basic types of inventory used by repositories. A complete inventory accounts for every object. A sectional inventory involves the inventory of only one section of the storage area, one collection, or one type of object. Sometimes, depending on funds and staff, a repository might devise and implement a continuing schedule of sectional inventories to make up a complete inventory over a particular period of time. A spot inventory is the third type. It is very limited in scope and only involves checking a small part of the collection, often using a random sampling procedure. Spot inventories are useful for quickly checking the accuracy of records and location information. The type and amount of inventory done usually depends on the repository's collection size, funding, types of materials housed, and mission. Regardless of how it is completed, all objects and associated records in the collections should be inventoried periodically, the more frequently the better. This includes not only items in storage but also those on exhibit, loan, or undergoing conservation. Archival collections, on the other hand, are usually inventoried upon acquisition by collection unit, not individual records. After archival processing (arrangement and description), the finding aids produced take the place of an inventory. Planning and scheduling inventories is an important task due to the staff time and funds involved. Planning includes determining the minimum amount of critical information that needs to be recorded. Inventory information usually includes object number, name, location, and condition. Information collected during an inventory should then be reconciled with repository records to ensure that it is correct and up-to-date. Organization is the key to a smooth and fast inventory. If the storage containers, objects, and collections are well organized and labeled, the inventory process should not be difficult. Time and energy spent on inventories also may be minimized with the use of computerized inventory and catalog systems. Computer programs manipulate, search, and retrieve data faster and more completely, thereby increasing the value and usefulness of inventory information. Computerized cataloging and labeling systems, such as barcodes and barcode scanners, are becoming more common in repositories and can noticeably facilitate the inventory process.